Social Media has taught me how to listen more effectively. Social Media has taught me about human behaviour and business. Social Media has taught me about leadership. And the list goes on and on. There are however many lessons we still need to learn in life and some we can still learn from Social Media. The one area that is particularly difficult to handle in life and the same goes for Social Media, is that of Criticism. How we handle criticism, how we respond to criticism and what we ultimately do because of the criticism we receive, will determine if we are successful or not. Criticism will ultimately cause us to grow if we let it and this can only occur if we can learn something from the criticism. 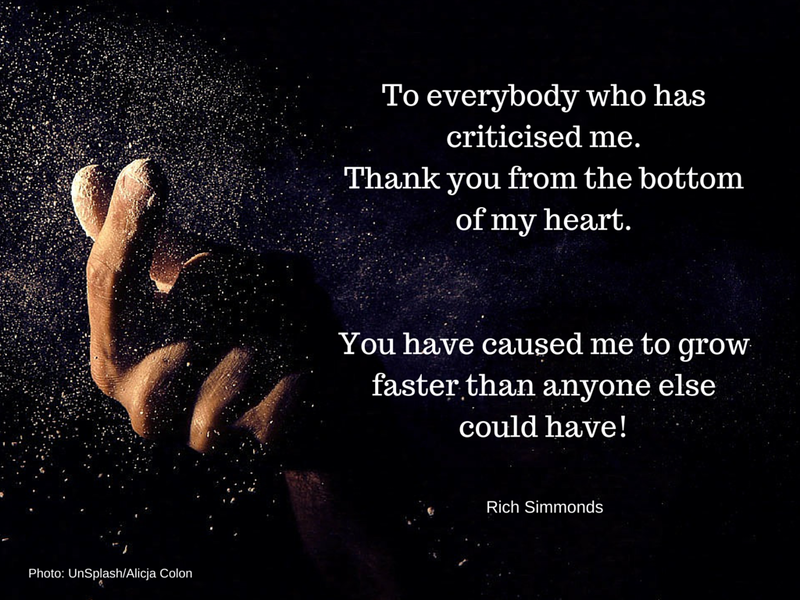 Sometimes there will be nothing to learn from the criticism itself and in these instances you may just find that you were being tested to see how emotionally intelligent you are. Could you be kind or did you need to be right? We could go into more depth about being right, but that has been covered in my video titled Emotional Intelligence – Behind the bathroom door? What other people say about you is their business, it has nothing to do with you! Remember the above quote and show people who you are through your actions. On Social Media this means just keep on doing what you do, keep your focus to do what you set out to do. You are what you consistently do and the only time you need to worry about what you are doing is when you are not being consistent. Be yourself, everyone else is taken. This entry was posted in Inspiration, LEADERSHIP and tagged criticism, social media. Bookmark the permalink. Thank you for this message Rich. It really is important for us to be ourselves and to care less what people say of us, as long as we are focused on something good. I used to care so much if people approved of me or not. However, I came to terms with the fact that no matter what I do, some people will still have negative things to say, so I made up my mind to learn to ignore their negativity and look at the positives. Some times, the criticisms we get are warranted, but when we look at them constructively we will find that there is always something we can gain and improve ourselves with.